#A-22 on display, October 2, 2004. #A-22 garage interior, Oct. 2, 2004. #A-22 dining room interior, Oct. 2, 2004. #A-22 at North Freedom, April 2000. 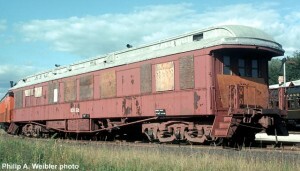 GN #A22 (Hill Car), roster photo, Sept. 1972. Ektachrome 35mm transparency. Philip A. Weibler photo. A-22 at St. Paul, unknown date. 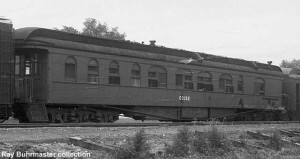 Great Northern #A-22 began its career in the railroad’s St. Paul shops as a wooden business car. 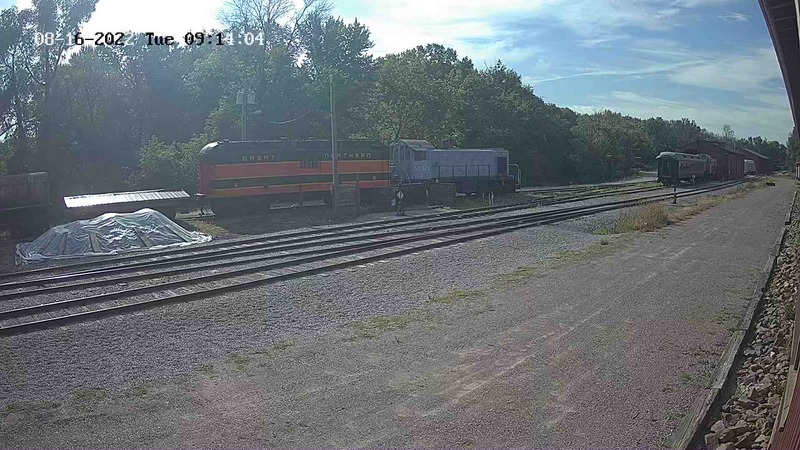 It was used by Louis W. Hill, then president of the Great Northern Railway, which had been founded by his father, James J. Hill. The business car’s most unique feature–its garage–was originally Louis Hill’s idea. His love for the automobile matched his passion for improving the range and efficiency of the Great Northern Railway itself. 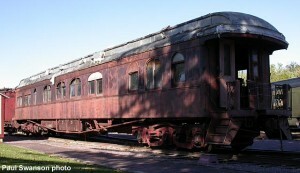 The inclusion of automobile storage space, along with living and working quarters on the same railcar proved to be a revolutionary, yet practical decision. Automobiles, such as early 20th century Packards, Pierce Arrows, Oldsmobiles, and Lincolns were originally loaded and unloaded from the #A-22 using a block and tackle rope system, aided by ramps that attached to the end of the business car’s platform. This method however was quickly replaced by a hand winch (also Louis Hill’s idea) that was permanently secured to the floor of the business car in the garage area. 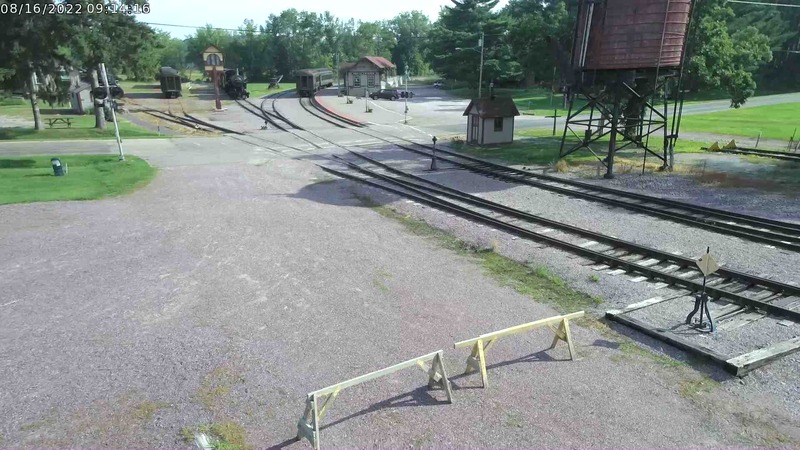 The easiest method however for loading and unloading automobiles proved to be large pre-built stationary ramps in rail yards or on sidings, to which the #A-22 could be backed up and the automobiles rolled on and off. In comparison to other private business cars of the early 20th century, the #A-22 would have been considered rather plain. Painted standard Pullman green, with little interior decoration and no extra frills, the #A-22 paled in comparison to the opulent and extravagant “Palace Cars” built and owned by Louis Hill’s contemporaries. The austere elegance of the #A-22’s decor very simply illustrated Hill’s frugal nature. 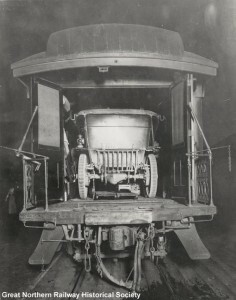 The business car traveled from coast to coast as Louis Hill promoted the growth of the Great Northern Railway year round. In addition to business, the #A-22 was also the preferred method of transportation for Hill family vacations and hunting trips. After forty-three years in business car service, from 1905 until 1948, the Great Northern #A-22 was converted to work service in 1950. 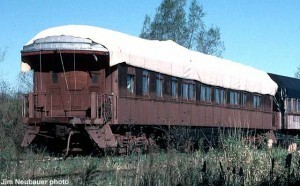 Though the #A-22 had had a tremendous number of upgrades over the years, including the addition of electricity, the application of steel sheathing and a steel under-frame, the introduction and improved reliability of the automobile had outdated the use of private business cars. After entering work service, the #A-22 was renumbered #03132 and has remained so to this day. In 1970, the Great Northern merged with the Northern Pacific and CB&Q to form the Burlington Northern. Having outlived its use in work service, the former #A-22 was donated to Mid-Continent by BN in 1972. After arrival at North Freedom it the #A-22 was donated, it was utilized for a brief time as the Mid-Continent office in the early 1980’s. 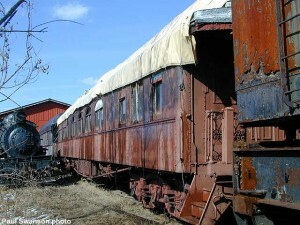 Since then, the #A-22 has been stored on the Mid-Continent grounds patiently awaiting restoration. June of 2005 will mark the 100th birthday of the #A-22. 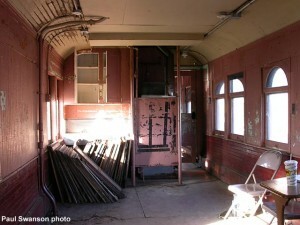 In honor of this milestone, plans for the restoration of the Great Northern #A-22 are now underway. 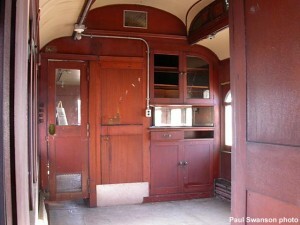 Plans include restoring the business car to its original wood car form and recreating the interior, including the automobile storage space.